The doors refused to budge. And just like that I was coldly torn back down to reality, with the sudden realisation that, in a bout of zen torpor (if nothing else a testament to the head-mushing delights of Hôtel Barrière Le Fouquet’s aqua circuit) I had only gone and dumped my room card in the robes bin. Sadly for me, it was also the spa lift’s magic Open Sesame and only way to coax the doors open – to protect robed customers’ modesty on their way back to their quarters. Back at base, I had barely reeled off a stuttered apology when the spa attendant shot off to retrieve my jettisoned card from the depths of the panier with as much urgency as if I’d told her I’d mislaid a gazillion-pound Cartier ring. “It happens to everyone,” she smiled conspiratorially, producing the damp key. I couldn’t quite imagine Amal Clooney, a regal Meryl Streep or any other of the constellation of stars who regularly pass through Le Fouquet’s trapped in a lift out of their own sheer stupidity. I may never hold a candle to their effortless grace but to the kind attendant I might as well have been Madame Macron for all her attention, care – and complimentary bin-diving. Despite its opulence, celebrity kudos and coveted location at the corner of the Champs-Elysées and Avenue George V (in the orbit of the Arc de Triomphe), Le Fouquet’s is refreshingly free from the usual phalanx of clipped or downright snooty butlers buttering up the conspicuously rich and famous and turning their Gallic noses up at the glorious unknown. Though that doesn’t mean they don’t act or look the part. One glimpse at the trilby-clad porters tells you this is a cradle of luxury all right. This is, I suspect, a welcome upshot of the lavish hotel’s humble beginnings in the 19th century as a coachman’s café. 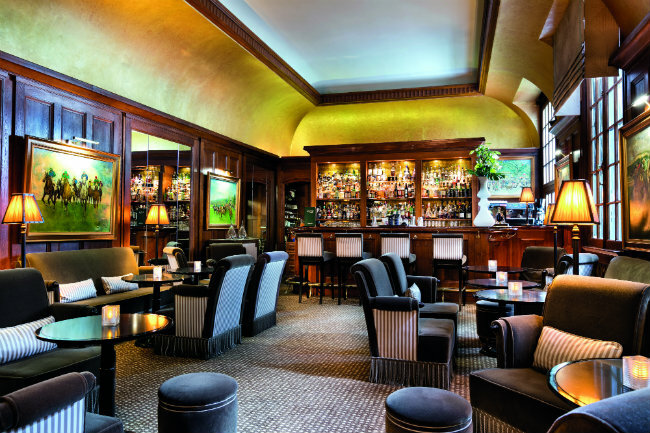 Spying the watering hole’s untapped potential on the prestigious avenue, in 1899 Louis Fouquet transformed it into a trendy bar. A decade later it was relaunched as a modish brasserie. 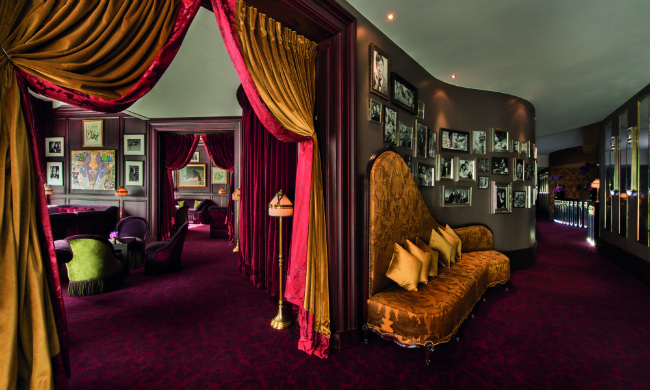 The haunt du jour, it cast its spell on such It girls as Josephine Baker and Marlene Dietrich, who quickly cemented its status as the favourite hangout of the film industry. In fact, for the past 30 years the mythical eatery has hosted the glitzy César movie award winners’ luncheon. A list of laureates is carved for posterity in a miniature copper version of the Hollywood Walk of Fame at the entrance. Former president Nicolas Sarkozy too was charmed by its wood-panelled wiles, and famously threw an exorbitant victory dinner at Le Fouquet’s – a decision that set the “bling-bling” tone of his controversial presidency. Though having now gorged on the swish restaurant’s moreish yet delightfully unfussy fare, I’d wager Sarko doesn’t regret his choice of locale one bit. 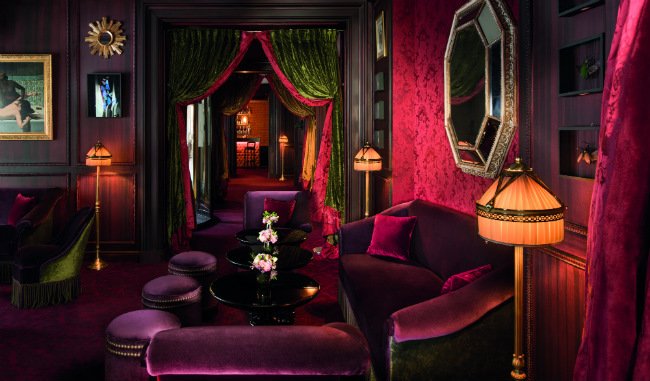 In 2006, under the auspices of the Barrière clan, Le Fouquet’s was given a new lease of life as a five-star hotel (and brasserie) complete with a dramatic molded concrete Haussmann-style façade. 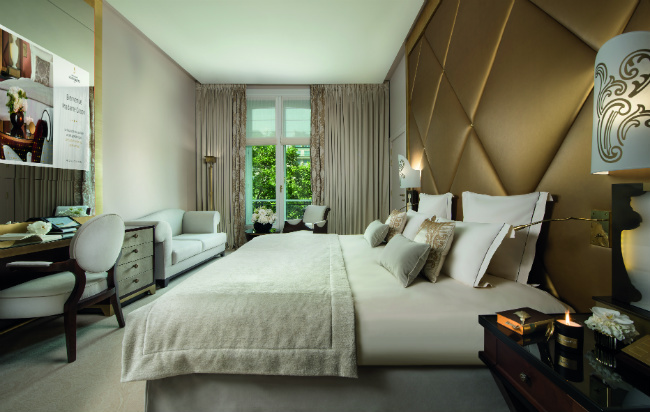 At the tail end of 2016, designer Jacques Garcia refreshed the interiors as part of a six-month renovation. 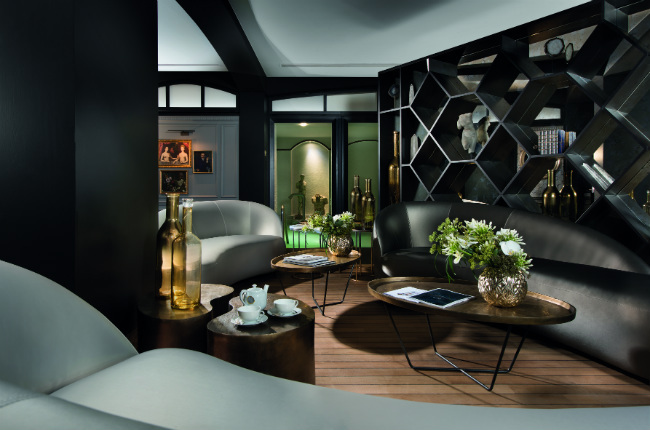 The Tout-Paris held its breath last summer as the hotel emerged from its scaffolding cocoon – and it was every bit worth the wait. 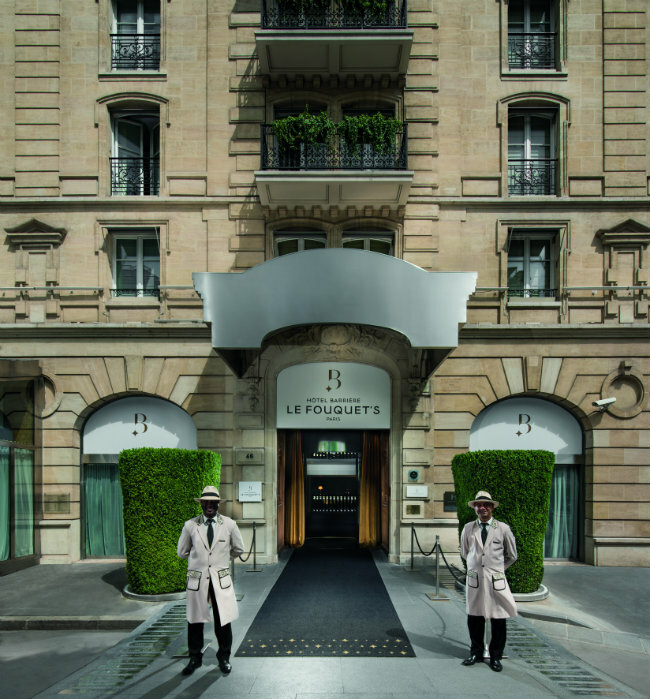 A deft marriage of period features, nods to its cinematic legacy in the black-and-white headshots festooned across the boudoir-style lobby, and full-tilt contemporary luxe, the revamped Le Fouquet’s feels both timeless and boldly modern. 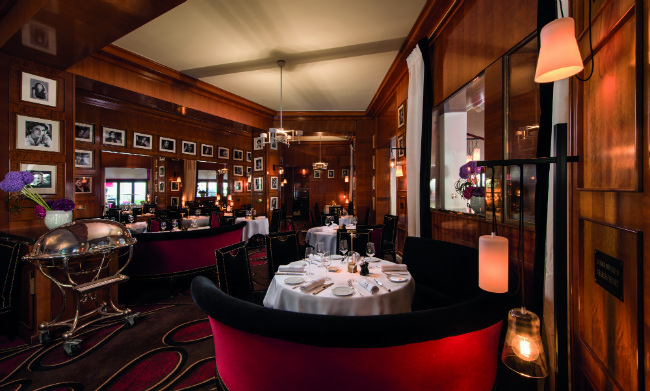 The brasserie, with its intimate subdued lighting and tasteful smatterings of silver-screen memorabilia (each table is named after one its illustrious regulars), is still very much the life and soul of Le Fouquet’s. A-Listers were conspicuously absent as we sat down to a feast of caviar (why scrimp? ), chef Pierre Gagnaire’s pan-fried scallops and oh-so indulgent signature Millefeuille. Here as in the hotel, staff’s ability to anticipate diners’ needs borders on the prophetic. Water was topped up the very second the level dropped an inch, and waiters’ attentive, “Tout se passe bien?” was the jaunty refrain of our scrumptious supper. – not mats, actual plump cushions – flanking our respective bedsides, draped with fluffy towels, the lot topped with slippers to protect our fragile tippy-toes from unnecessary contact with the (impossibly soft) carpet. Did I mention the sleeping mist ready to spritz us into a soundless slumber? 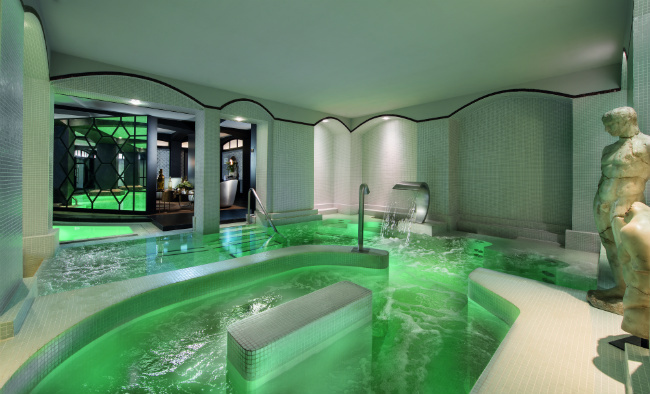 the warm embrace of the emerald-tinted pool, the enveloping plumes of the hammam and sauna – or the bracing snap of the cryotherapy capsule (an ice chamber) for those so inclined. Midway between Haussmannian apartment and art gallery, the colonnaded lagoon is quite the chic affair of boiseries and paintings, not to mention a stylish lounge to rest your weary glutes after a few laps. And then, there is the pièce de résistance, the aqua circuit pool – the only one of its kind in Paris – with its rejuvenating trail of jets, and counter-current lane ready to sweep sirens like me into such a deep whirlpool of zénitude they lose their grip on reality – and their key. 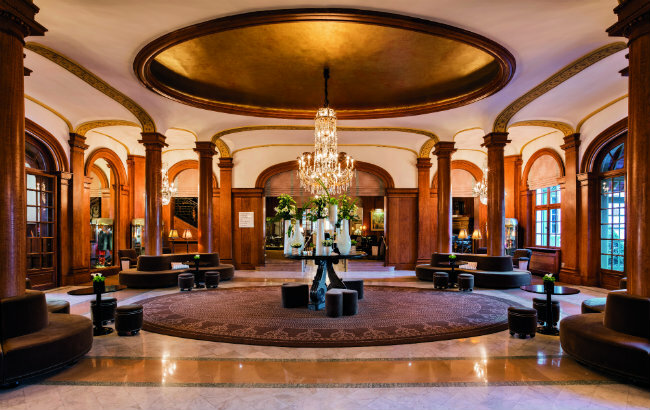 Emerging from my Barrière-induced haze, I bid one last farewell to the ever-so aloof stars beaming at me from the lobby, hoping I’d have more celeb-spotting luck at my next stop, Le Fouquet’s venerable sister hotel in Deauville, Le Normandy. 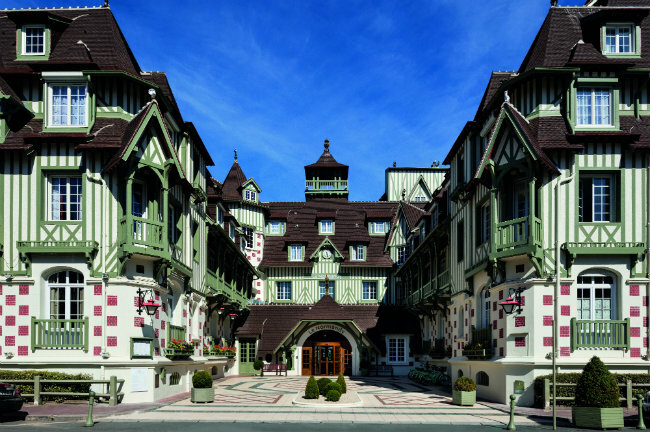 A Belle-Époque confection with all the gabled Neo-Norman trimmings, Hôtel Barrière Le Normandy was inaugurated in 1912 at the height of the bains de mer (which saw well-heeled Parisians swarm to the seaside resort of Deauville to reap the curative rewards of salt water). Its prime position on the chic Côte Fleurie and heady extravagance quickly seduced a moneyed crowd of sybarites, trendsetters, blue bloods and the inevitable slew of upstarts. Notable past check-ins include Winston Churchill and Coco Chanel, who not only opened a hat shop at the hotel but dreamt up her most audacious fashions at the resort. It is said that her trademark beige hue was inspired by Deauville’s wave-lapped sand, while her Breton-stripe shirts and trousers were an elevated take on sailors’ kit. Prince Charles too was so taken with Deauville’s drop-dead wiles that he celebrated his 30th birthday at Le Normandy. 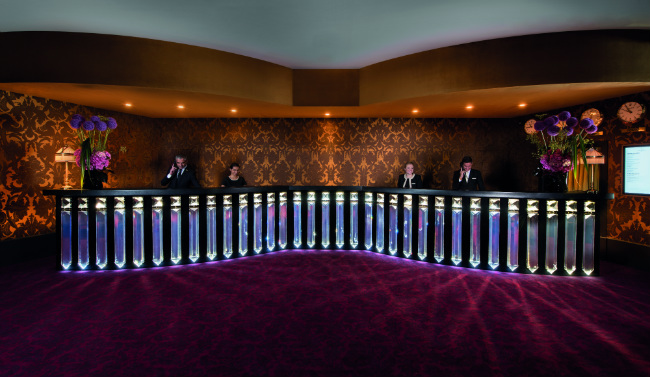 The celebrity hangout’s popularity hit fever pitch in the 1970s with the launch of the Deauville American Film Festival, which threw the jewel-box pile under Tinseltown’s radar – as evidenced by the floor-to-ceiling wall of photographs, from Elizabeth Taylor to Sean Connery, gracing the marble-lined lobby. The casino, tennis courts, riding stables and golf course were no doubt quite the draw too. There are whispers of an underground tunnel burrowing its way from the hotel to the Palais des Congrès, where the film festival is held every autumn to spare distinguished guests unpleasant run-ins with the paparazzi. Funnily enough, it’s not signposted to mere mortals like us fancying a flavour of the showbiz experience. After a vain and exhausting search for said door, we were finally escorted to our sea-view room by an infinitely patient porter. As we made for the lift (no incidents to report), we passed what appeared to be a guide reeling off a catalogue of the chic retreat’s fresh additions and historic features. 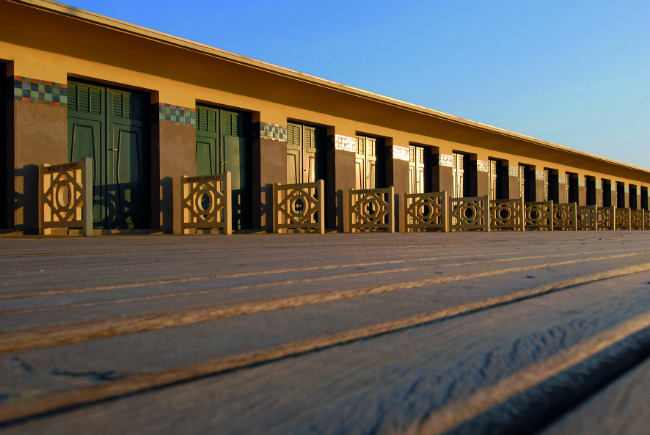 The hotel is as much a landmark and tourist attraction as the resort’s iconic Les Planches boardwalk. And its recent renovation (which saw Le Normandy close for the first time since 1912) is still very much the talk of the seaside nook, and an object of fascination, three years on. 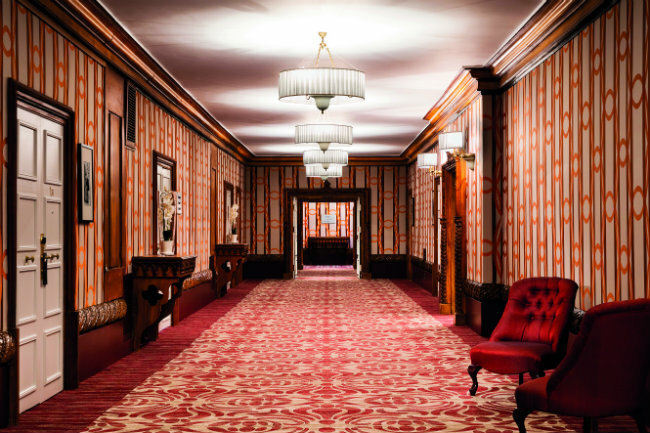 Like at Le Fouquet’s, designers Nathalie Ryan and Alexandre Danan had their work cut out to kit out the legendary hotel – where a young Claude Lelouch directed his Oscar-winning A Man and a Woman on the third floor – with all the modern bells and whistles while keeping its charms intact. But the duo delivered. The bucolic Toile de Jouy decking the rooms in a spectrum of Normandy green, soft brick, blue and puce transports you straight back to the insouciance of the 1900s. Every last detail has been thoroughly considered, and subtle nods to the station balnéaire’s seaside location and equestrian heritage are cleverly concealed in the décor, not least the stylised shellfish pattern crisscrossing the deep orange carpet in the mile-long corridor and the horse bits looping through the wallpaper. Surprisingly, for all its Hollywood cachet and swish add-ons, Le Normandy is very much a family hotel, and pleasantly convivial. Staff roll out the red carpet for their young clients with a ‘five-star’ Petit VIP studio and kids’ club – which welcomes tiddlywinks from the cradle or close enough (three months old at the Babiwi nursery) – and a teen space to boot. Nowhere is this child-friendly approach more glaring than in the glass-canopied pool at the Spa Diane Barrière. An oasis of peace it is not before bedtime. Children, it seems, get first dibs at the piscine in high season. As we trotted down to the spa, we were duly greeted by a cacophony of excited squeals. Not ideal for those in search of a tranquil Xanadu but just the ticket for harried parents after a little me-time while babysitters entertain the brood. Suitably rejuvenated after a steam and soak (post-minis rush hour) and ravenous from a few languid laps, we headed to Le Normandy’s revamped restaurant, La Belle Époque. 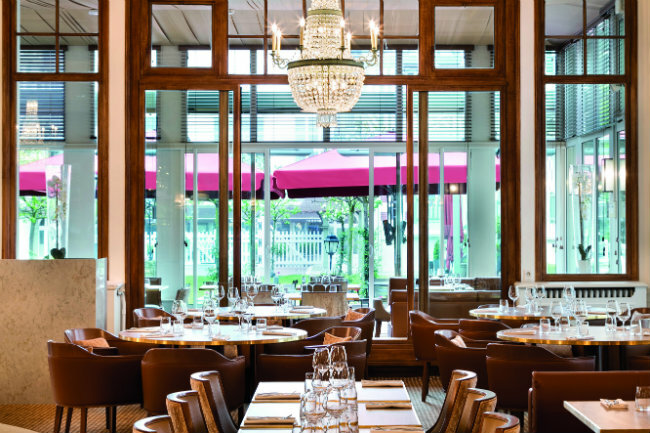 A shining beacon luring famished patrons with its lit-up ‘backbar wall’ and crystal chandeliers, the eatery serves up both updated brasserie staples and imaginative fusion dishes. Opting for a mix of pepped-up classics and exotic fare, I let myself be tempted by the Poke Bowl, a moreish entrée of gambas and calamari on a bed of quinoa and wakame followed by a hefty steak tartare à la Belle Époque, the condiments fanned out like dainty petals on the minced meat, all finished off with a Mont-Blanc ‘sundae’ liberally drizzled in a thin blueberry marmalade. For more information, visit www.hotelsbarriere.com. 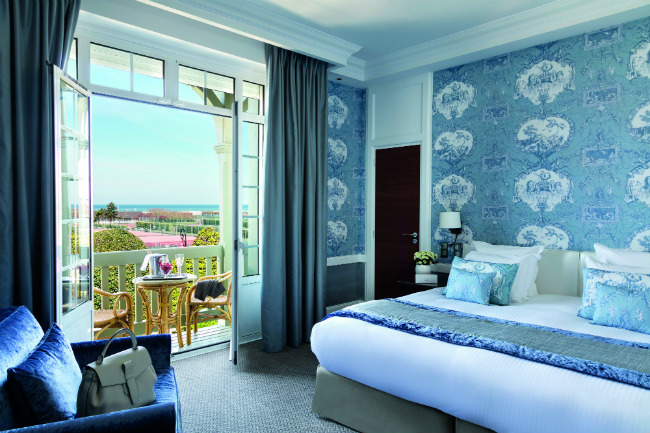 Rooms at Le Fouquet’s start from €650 Rooms at Le Normandy start from €250. Marion is the Deputy Editor of France Today and French Entrée. Marion left Paris for the bracing shores of Scotland 12 years ago and never looked back (a kilted Scot may have been involved). 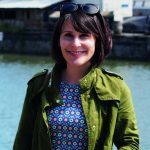 After graduating from Edinburgh University she trained as a journalist and honed her pen in newsrooms across the South West (with a brief segue into fashion writing) before joining the fold at the France Media Group. Now back to her roots, she spends most of her days baffled and amazed at France's cultural wealth and her compatriots' wonderful quirks.